Our shop was established in 1865, and for 150 years we have offered a wide selection of approximately 90 different delightfully flavored products. We use only the choicest peanuts, soy beans, broad beans, peas, almonds and other ingredients, and our roasting and processing methods remain unchanged from the Edo Period. Our products are sold directly to the customer, and the key word with us is freshness. In a corner of our shop we demonstrate how we deep-fry mochi rice cake to produce a flavorful rice cracker called “Shio-okaki”. 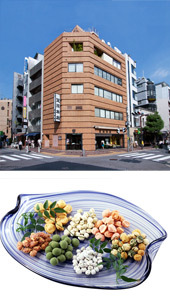 Our most popular treat is “Otoboke Mame”, peanuts with a nori or shrimp flavored coating. Another great favorite is our green tea flavored peanuts.